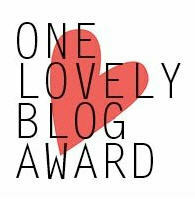 The first step in accepting One Lovely Blog Award is to mention seven things about lil’ ole me. 2. I squeeze lemon on almost everything. If I don’t add lemon, then I like to sprinkle cinnamon on many other things like coffee and white or red pasta sauces. I once read that cinnamon aides in that awful thing that humans are obsessed about–you know that over used word in products anti-aging…AGING…AGING…AGING. How it helps you keep young? I don’t know, I just love it! 4. I sneak veggies into everything I make. Zucchini is the easiest. Shred with a grater and toss it in with the onions & garlic for sauteing and add to red or white sauces. You cannot taste or see it as long as you peel the skin off first. Shred it and blend it (raw) with a pancake mix and the kiddos have their veggies for breakfast. Sweet potato pancakes are our favorite. 5. My husband is a better cook (and mixologist) than my impatient self. But I trump him at tiding up and organizing. 6. I have moved nine times (does not even include college moves) and still counting unfortunately. Such is the glamorous life of a gypsie. 7. It scares me how we take for granted the resources of our planet. We should be thinking and taking drastic action to make it better than how we received it. There is only one planet we can live on, why isn’t it phasing us that we are depleting resources or polluting her with toxins. I fear for the next generations. Again thank you for the OLBA. Sometimes when the crowd (can two people under the age of ten be considered a crowd?) seems insatiable during the day…there are the evenings. The time when my crowd of two clings onto me for goodnight kisses and when I retreat to the blogging world for such a special honor.